For other uses, see Golf course (disambiguation). Many older courses are links, often coastal. Courses are private, public, and municipally owned, and typically feature a pro shop. Many private courses are found at country clubs. Fountain pond at Seltenheim Golf Course Klagenfurt-Seltenheim, Austria. Fairway at Lord Howe Golf Course, Lord Howe Island, NSW, Australia. Water feature at the Shell Point Golf Course, Iona, Florida. Although a specialty within landscape design or landscape architecture, golf course architecture is considered a separate field of study. Some golf course architects become celebrities in their own right, such as Robert Trent Jones, Jr.; others are professional golfers of high standing and demonstrated appreciation for golf course composition, such as Jack Nicklaus. The field is partially represented by the American Society of Golf Course Architects, the European Institute of Golf Course Architects, and the Society of Australian Golf Course Architects, although many of the finest golf course architects in the world choose not to become members of any such group, as associations of architects are not government-sanctioned licensing bodies, but private groups. While golf courses often follow the original landscape, some modification is unavoidable. This is increasingly the case as new courses are more likely to be sited on less optimal land. Bunkers and sand traps are almost always artificial, although other hazards may be natural. The layout of a course follows certain traditional principles, such as the number of holes (nine and 18 being most common), their par values, and the number of holes of each par value per course. It is also preferable to arrange greens to be close to the tee box of the next playable hole, to minimize travel distance while playing a round, and to vary the mix of shorter and longer holes. Combined with the need to package all the fairways within what is frequently a compact square or rectangular plot of land, the fairways of a course tend to form an oppositional tiling pattern. In complex areas, two holes may share the same tee box, fairway, or even green. It is also common for separate tee-off points to be positioned for men, women, and amateurs, each one respectively lying closer to the green. Eighteen-hole courses are traditionally broken down into a "front 9" (holes 1–9) and a "back 9" (holes 10–18). On older courses (especially links courses, like the Old Course at St. Andrews), the holes may be laid out in one long loop, beginning and ending at the clubhouse, and thus the front 9 is referred to on the scorecard as "out" (heading out away from clubhouse) and the back 9 as "in" (heading back in toward the clubhouse). More recent courses (and especially inland courses) tend to be designed with the front 9 and the back 9 each constituting a separate loop beginning and ending at the clubhouse. This is partly for the convenience of the players and the club, as then it is easier to play just a 9-hole round, if preferred, or stop at the clubhouse for a snack between the front 9 and the back 9. A successful design is as visually pleasing as it is playable. With golf being a form of outdoor recreation, the strong designer is an adept student of natural landscaping who understands the aesthetic cohesion of vegetation, water bodies, paths, grasses, stonework, and woodwork, among other elements. Most golf courses have only par-3, −4, and −5 holes, although some courses include par-6 holes. The Ananti CC and the Satsuki golf course in Sano, Japan are the only courses with par 7 holes. Typical distances for the various holes from standard tees are as follows. Harder or easier courses may have longer- or shorter-distance holes, respectively. Terrain can also be a factor, so that a long downhill hole might be rated par 4, but a shorter uphill or severely treacherous hole might be rated par 5. Tournament players will usually play from a longer-distance tee box (the Championship or Tournament tee) that is behind the standard men's tee, which increases the typical distance of each par; a par-3 hole can be up to 290 yards (270 m), and longer par-4 holes can measure up to 520 yards (480 m), which can also be accomplished by converting a par-5 hole into a long par-4 hole for tournament players. This compensates for the generally longer distance pro players can put on tee and fairway shots as compared to the average "bogey golfer". The game of golf is played in what is called a "round". This consists of playing a set number of holes in an order predetermined by the course. When playing on an 18-hole course, each hole is played once; whereas, on a nine-hole course each hole can be played twice to complete a round. To begin a hole, players start by striking the ball off a tee. Playing the ball off a tee can only be used on the first shot of every hole although it is not required to use a tee on the first shot. Tees are a small wooden or plastic peg used to hold the ball up, so that when hit by the club the ball travels as far as possible. The first section of every hole consists of the teeing ground, or tee-box. There is typically more than one available box where a player places his ball, each one a different distance from the hole (and possibly with a different angle of approach to the green or fairway) to provide differing difficulty. The teeing ground is generally as level as feasible, with closely mown grass very similar to that of a putting green, and most are slightly raised from the surrounding fairway. Red – Closest to the hole and often placed to minimize the influence of major hazards like water; typically used by ladies of all ages, juniors (up to age 12), and novice players of any age/gender. Gold- Next farthest, typically used by teenage boys, low-handicap ladies, and senior or high-handicap men. White – Farther still, typically used by low-to-average-handicap men and low-handicap teenage boys. Black or Blue – The farthest tee from the hole and with the most exposure to any major hazards; typically used only during tournaments or by zero-handicap ("scratch") male players. There may be additional tees available, depending on the course, and they may be labeled or colored differently depending on the club and its normal patronage. A club catering to senior players, for instance, may offer an additional tee further forward of the ladies' tee, labeled for "senior ladies". A municipal course may label a similarly placed tee the "junior" or "novice" tees. Silver and gold may be used to denote senior ladies' and men's tees, with the regular men's tee being white and the tournament tee being blue. In recent years, many golf courses have introduced mixed or "combo" tee boxes. A combo consists of playing some holes from one color of tee box and the remainder from one tee box ahead (or back). The selected tee box for each hole in a combo configuration is shown on the scorecard. Each combo tee configuration normally has its own course and slope rating. The use of combo tees allow courses to offer one or more additional options with respect to total yardage at a minimal cost. They can be effectively used when there is a large difference in total course distance between two traditional tee levels. In casual play, the tee a player hits from is usually their prerogative (there is no rule prohibiting a man from hitting off the closest tee box, nor any prohibiting a woman from using the tournament tee), but players will generally gravitate toward the traditional tee for their gender and/or age, as this will provide the best results given a player's nominal drive distance. Groups are often encouraged to compromise on one tee box, as this speeds the group's play. In tournaments, golfers generally tee off from the box one level further from the "normal" box for their class (men use the tournament tee, ladies use the senior or men's tee, and juniors use the ladies' tee). Typical doglegs. Left: "dogleg left". Right: "double dogleg"
After the first shot from the tee ("teeing off"), the player whose ball is farthest from the green hits the ball from where it came to rest; this spot is known as its "lie". When the ball is in play and not out of bounds or in a hazard you must play the ball as it lies. The area between the tee box and the putting green where the grass is cut even and short is called the fairway. The area between the fairway and the out-of-bounds markers, and also between a mowed apron surrounding the green and out of bounds, is the rough; the grass there is cut higher and is often of a coarser strain than on the fairways, making roughs disadvantageous areas from which to hit. On par-3 holes, the player is expected to be able to drive the ball to the green on the first shot from the tee box. On holes longer than par 3, players are expected to require at least one additional shot to reach their greens. While many holes are designed with a direct line-of-sight from the teeing ground to the green, a hole may bend either to the left or to the right. This is called a "dogleg", in reference to the similarity to a dog's ankle. The hole is called a "dogleg left" if the hole angles leftwards, and a "dogleg right" if the hole angles rightwards. A hole's direction may bend twice, which is called a "double dogleg". Just as there are good-quality grasses for putting greens, there are good-quality grasses for the fairway and rough. The quality of grass influences the roll of the ball as well as the ability of the player to "take a divot" (effectively, the ability to hit down into the ball, hitting the ball first, then hitting the turf and removing a portion of it as the club continues its arc). Fairways on prestigious tours, like the PGA Tour, are cut low. Mowing heights influence the play of the course. For example, the grass heights at U.S. Open events are alternated from one hole to the next in order to make the course more difficult. One example of this is the infamous roughs at U.S. Opens, which are often 3 to 5 inches high, depending on how close to the fairway or green the section of grass will be. This makes it difficult for a player to recover after a bad shot. Variants of grass used for fairways and roughs include bent grass, Tifway 419 Bermuda grass, rye grass, Kentucky bluegrass, and Zoysiagrass. As in putting-green grass types, not every grass type works equally well in all climate types. The putting green, or simply the green, is an area of very closely trimmed grass on relatively even, smooth ground surrounding the hole, allowing players to make precision strokes on it. To "putt" is to play a stroke on this surface, usually with the eponymous "putter" club, which has very low loft so that the ball rolls smoothly along the ground, and hopefully into the cup. The shape and topology of the green can vary almost without limit, but for practical purposes the green is usually flatter than other areas of the course, though gentle slopes and undulations can add extra challenge to players who must account for these variations in their putting line. The green typically does not include any fully enclosed hazards such as sand or water; however, these hazards can be – and often are – placed adjacent to the green, and depending on the shape of the green and surrounding hazards, and the location of the hole (which often changes from day to day to promote even wear of the turf of the green), there may not be a direct putting line from a point on the green to the cup. Golfers use a method known as "reading" the green to enhance their chances of making a putt. Reading a green involves determining the speed, grain, incline, decline and tilt of the green on the line of the putt. Most putts are not struck directly at the hole, instead they must be struck to take into account the characteristics of the green to arrive at the hole at the proper angle and speed. The best players will read the green by walking around the green and studying the characteristics of the green before addressing the ball. Reading the green and putting are considered by many golfers to be the most difficult part of the game. The green is typically surrounded by slightly higher grass, cut at a height between that of the green and fairway, and then by the fairway and/or rough. This longer grass surrounding the green is known as the fringe and is designed to slow and stop balls rolling along the green from an approach shot or errant putt, preventing them from exiting the green. Though putting strokes can be made on it, the higher grass can interfere with the path of the ball, so players often choose to use a lofted club such as an iron to make a "chip shot" or a "bump and run", where the ball carries in the air for a few yards and then rolls along the green like a normal putt. The grass of the putting green (more commonly just "green") is cut very short so that a ball can roll for a long distance. The most common types of greens for cold winter, but warmer summer regions (i.e., not extremely warm, as in the Southern and Southwestern United States) are bent grass greens. A green may consist of a thin carpet so that bad weather is not allowed to become a serious factor in maintaining the course. These are considered the best greens because they may be cut to an extremely low height, and because they may be grown from seed. Bent grass does not have grain, which makes it superior as a putting surface. However, bent grass may become infested with poa annua, a costly and time-consuming weed. Augusta National is one of many golf courses to use this type of green. The original design of Augusta National did not include bent grass greens, but in the 1980s the controversial decision was made to convert the greens from Bermuda to bent grass. This has affected the speed and playing of Augusta National. Many other golf courses subsequently made the decision to change from Bermuda to bent grass when they observed increased business at courses that had already changed over. Another type of grass common for greens is TifDwarf Hybrid Bermuda (other variants exist, but TifDwarf is one of the most common), or simply Bermuda grass. Bermuda is more common in regions that have very warm summers and mild winters, such as the Southern and Southwestern United States. Red Bridge Golf Course was the first course in North Carolina to utilize a special Bermuda called Mini Verde. A green is generally established from sod which has had the soil washed off of it (to avoid soil compatibility problems) and which is then laid tightly over the green, then rolled and topdressed with fine sand. Another common and more economical approach for establishing a putting green is to introduce hybrid Bermuda spriggs (the stolon of the grass which are raked out at the sod farm), which are laid out on the green. The best greens are always established vegetatively[clarification needed] and never from seed. Two downside factors of Bermuda greens are cost of maintenance, and also the existence of grain (the growth direction of the blades of grass), which affects the ball's roll and which is called "the grain of the green." The slope or break of the green also affects the roll of the ball. The hole, or cup, is always found within the green and must have a diameter of 108 millimeters (4.25 in) and a depth of at least 10 centimeters (3.94 in). Its position on the green is not fixed and typically is changed daily by a greenskeeper in order to prevent excessive localized wear and damage to the turf. A new hole will be cut by a device that removes a plug of the turf from the ground, and the reinforced cup is then moved, before the old hole is filled in with the plug cut from the new hole and levelled. The hole has a flag on a pole positioned in it so that it may be seen from a distance, but not necessarily from the tee. This location marker is officially called the "flagstick" but is also commonly referred to as the "pin.". Flagsticks are made of either coated fiberglass, metal, or wood and have a metal or synthetic bottom (called a ferrule) that is designed to fit in the hole cup. Putting greens are not all of the same quality. The finest-quality greens are well-kept so that a ball will roll smoothly over the closely mowed grass. Excess water can be removed from a putting green using a machine called a water hog. Golfers describe a green as fast if a light stroke on the ball makes it roll a long distance; conversely, on a slow green a stronger stroke is necessary to roll the ball the same distance. The exact speed of a green can be determined with a stimp meter. By collecting sample measurements, golf courses can be compared in terms of average green speed. It is, however, illegal by the Rules of Golf to test the speed of a green while playing by rolling a ball on it, or by feeling or rubbing the green. Holes often include hazards, which are special areas that have additional rules for play, and are generally of two types: (1) water hazards, such as ponds, lakes, and rivers; and (2) bunkers, or sand traps. Special rules apply to playing a ball that falls in a hazard. For example, a player may not touch the ground or water with their club before playing the ball, not even for a practice swing. A ball in any hazard may be played as it lies without penalty. If it cannot be played from the hazard, the ball may be hit from another location, generally with a penalty of one stroke. The Rules of Golf specify exactly the point from which the ball may be played outside a hazard. Bunkers are small to medium areas, usually lower than the fairway but of varying topography, that are filled with sand and generally incorporate a raised lip or barrier. It is more difficult to play the ball from sand than from grass, as the ball may embed itself into the sand, and the loose nature of the sand and more severe sloping of many bunkers make taking one's stance more difficult. As in any hazard, a ball in a bunker must be played without touching the sand with the club except during the stroke, and loose impediments (leaves, stones, twigs) must not be moved before making the stroke. Often, a golf course will include among its facilities a practice range or driving range, usually with practice greens, bunkers, and driving areas. Markers showing distances are usually included on a practice range for the golfer's information. Driving ranges are also commonly found as separate facilities, unattached to a golf course, where players may simply hit balls into the range for practice or enjoyment. There may even be a practice course (often shorter and easier to play than a full-scale course), where players may measure the distance they can obtain with a specific club, or in order to improve their swing technique. Practice courses often consist of old holes of a previous design that are kept and maintained for practice purposes or as substitute holes if one or more holes become unplayable; a 21-hole golf course, for instance, will have three additional holes that can be used for practice or as substitutes for a flooded or otherwise damaged hole. Links is a Scottish term, from the Old English word hlinc : "rising ground, ridge", describing coastal sand dunes and sometimes similar areas inland. It is on links land near the towns of central eastern Scotland that golf has been played since the 15th century. The shallow top soil and sandy subsoil made links land unsuitable for the cultivation of crops or for urban development and was of low economic value. The links were often treated as common land by the residents of the nearby towns and were used by them for recreation, animal grazing and other activities such as laundering clothes. The closely grazed turf and naturally good drainage of the links was ideal for golf, and areas of longer grass, heather, low growing bushes and exposed sand provided the hazards that are familiar on modern courses. Although early links courses were often close to the sea it was rarely used as a hazard, perhaps due to the instability of the dunes closest to the water and the high cost of hand-made golf balls precluding anything that could result in their irrecoverable loss. The land is naturally treeless and this combined with their coastal location makes wind and weather an important factor in links golf. Traditional links courses are often arranged with holes in pairs along the coastline; players would play "out" from the town through a series of holes to the furthest point of the course, and then would return "in" along the second set of holes. The holes may share fairways and sometimes greens (such as at St Andrews to economize on land use, but in modern times this is rare due to the potential for injury from balls coming the other way. Famous links courses include the Old Course at St. Andrews, often described as the "Home of Golf", and Musselburgh Links, which is generally regarded as the first recorded golf course. The Open Championship, the oldest of golf’s major championships, is always played on a links course. Links and links-style golf courses have been developed throughout the world, reproducing the broken, treeless terrain with deep bunkers of their Scottish prototypes. 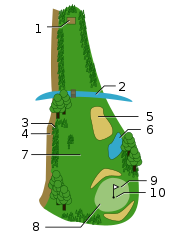 A "9-hole course", typically the type referred to as an "executive course", has only 9 holes instead of 18, but with the otherwise normal mix of par-3, par-4 and par-5 holes (typically producing a par score of between 34 and 36), and the course can be played through once for a short game, or twice for a full round. A "par-3" course has either 9 or 18 holes, and the distance of each hole is a par 3 rating (typically 240 yards or less from the "men's" tee), with no par-4 or par-5 holes mandating shots through the green (though, occasionally, a "par-3" course may feature a par-4 or even a par-5 hole). As a result, the total par for 18 holes of a par-3 course would be 54 instead of a typical 68–72. Some par-3 courses still require the use of a wood on some tee shots, and thus a "complete" set of clubs is used. A common standardized type of par-3 course is the "Pitch and Putt" course, where each of the 9 or 18 holes has a distance from tee to cup of less than 100 yards, with an overall 18-hole course distance no more than 1,200 yards (so each hole averages 67 yards). This allows the course to be played without a full set of clubs; typically only wedges are needed, possibly a 9-iron for the longest holes, along with a putter, to play the course. The rules for formal Pitch and Putt competitions mandate a three-club limit, consisting of two irons and one putter. These types of courses provide a faster pace of play than a standard course, and get their name from their target patronage of business executives who would play the course on a long lunch or as part of a meeting. They are also popular with young professionals, because during the normal golf season, the course can usually be played in the time between the end of the work day and sundown. The popularity of the 9-hole course has waned in recent decades; a full 18-hole course still allows for the player to play only the "front nine" or "back nine" as a shorter game, while attracting more golfers seeking to play a traditional full round of 18 distinct holes. Many older executive courses have been upgraded "in-place" to 18 holes and a traditional par score, or the original course was sold for other development and new land was acquired and built into an 18-hole course. By contrast, par-3 courses, especially Pitch and Putt, are rising in popularity as a compromise between the long play time and high skill levels required of a traditional 18-hole course, and the artificial nature and single-minded putting focus of miniature golf. Pitch and Putt, specifically its governing association the IPPA, has received financial support and logo rights from the R&A. In 2014, the PGA Tour held a Champions Tour event on a nine-hole par-3 course, the Big Cedar Lodge Legends of Golf in Ridgedale, Missouri, with four (regular division) or three (over-65 division) rounds played over the par-3 course, and one round played on a nearby regulation 18-hole course with par of 71. Pitch and putt is an amateur sport, similar to golf and is also known as chip and putt. The maximum hole length for international competitions is 90 metres (100 yd) with a maximum total course length of 1,200 metres (1,310 yd). Players may only use three clubs; one of which must be a putter. The game is played from raised artificial teeing surfaces using a tee and it has its own handicap system. There are three main categories of ownership and management of a golf course: private, commercial, and municipal. A private course is owned and managed by a golf club on behalf of its members, on a non-profit basis. Many of the courses opened during the golf booms in the late 19th and early 20th centuries are of this type. Some courses, such as Augusta National, are highly exclusive and will only allow visitors to play at the invitation of and alongside a member of the club. Others allow visitors at certain times but may insist on advance booking and proof of golfing competency. A commercial course is owned and managed by a private organisation and is operated for profit. They may be constructed to provide a core or supplementary attraction for visitors to a hotel or commercial resort, as the centrepiece to a real estate development, as an exclusive Country Club, or as a "Pay and Play" course open to the general public. Notable examples include Pinehurst in the USA and Gleneagles in Scotland. A municipal course is owned and managed by a local government body for the benefit of residents and visitors. Some of the historic Scottish golf courses, including St Andrews and Carnoustie fall into this category along with Bethpage in the USA and many others of less renown. It is increasingly common for the management of municipal courses to be contracted out to commercial or other organisations or the course to be sold or shut down completely. Many commercial and municipal establishments have associated golf clubs, who arrange competitions for their members on the courses and may provide clubhouse facilities. In the UK particularly, some older private members clubs have an associated "Artisan" club, originally established to provide low-cost golf with limited playing rights in exchange for unpaid work on the course. These associated clubs may be totally independent organisations from the course management, or may have various degrees of formal or informal links. Environmental concerns over the use of land for golf courses have grown since the 1960s. Specific issues include the amount of water required for irrigation and the use of chemical pesticides and fertilizers in maintenance, as well as the destruction of wetlands and other environmentally important areas during construction. The United Nations estimates that, worldwide, golf courses consume about 2.5 billion gallons/9.5 billion litres of water per day. Many golf courses are now irrigated with non-potable water and rainwater. In 1988, the U.S. Environmental Protection Agency prohibited the use of Diazinon on golf courses and sod farms because of its negative impact on bird species. Environmental concerns, along concerns with cost and human health, have led to research into more environmentally sound practices and turf grasses. Golf course superintendents are often trained in the uses of these practices and grasses. This has led to significant reduction in the amount of both water and chemicals on courses. Golf course turf is an excellent filter for water and has been used in communities to cleanse grey water, such as incorporating them into bioswales. The use of natural creeks and ponds is generally desirable when designing a golf course for their aesthetics and the increase in playing difficulty. However, such areas also typically include wetlands within the flood plain that are unsuitable for golfing and are often filled in and raised to remain dry. In arid areas, dry creek beds can be marked as "water hazards", but the importation of non-native grasses and other plant life can have a detrimental effect on native landscapes, often requiring non-native soil and large quantities of water and fertilizer to maintain the course. In these areas, course builders are often prohibited from growing and maintaining non-native grass on areas of the course other than the fairway, or even on the fairway itself, in which case only greens are allowed to have grass. In the U.S., land administered by the Army Corps of Engineers, such as those bordering levees and lakes, is often desirable for building courses, due to the scenic natural views and the unsuitability of the land for other purposes due to it lying in a planned flood plain. In these cases, the course designer must work with the Corps of Engineers to plan a course layout that protects environmentally sensitive areas, provides for a means of quick escape in case of flooding, and does not invite players to hit into or toward controlled structures such as levees or dams. Some environmentalists and other activists continue to lobby against the building of new golf courses, claiming they may impede corridors for migrating animals and damage sanctuaries for birds and other wildlife, though some courses have become havens for native and non-native creatures. A result of modern equipment is that today's players can hit the ball much farther than previously. As a result, because of demand from course customers who possess this enhanced equipment, and also out of an expressed concern for safety, golf course architects have had to lengthen and widen golf courses. Where a 7,000-yard course used to be a great rarity, courses measuring 7,500-yards are now not uncommon, and courses of 8,000-yards are being contemplated. All this has led to a ten-percent increase in the acreage required to build a typical course. At the same time, water restrictions established by communities have forced courses to limit the amount of maintained turf grass. While most modern 18-hole golf courses occupy as much as 60 hectares (150 acres) of land, the average course has 30 hectares (74 acres) of maintained turf. Golf courses can be built on sandy areas along coasts, on abandoned farms, among strip mines and quarries, and in deserts and forests. Many Western countries have instituted environmental restrictions on where and how courses are allowed to be built. In some parts of the world, attempts to build courses and resorts have led to protests, vandalism, and violence. Populists perceive golf as an elitist activity, and thus golf courses become a target for popular opposition. Resisting golf tourism and golf's expansion has become an objective of some land-reform movements, especially in the Philippines and Indonesia. In the Bahamas, opposition to golf developments has become a national issue. Residents of Great Guana Cay and Bimini, for example, are engaged in legal and political opposition to golf developments on their islands, for fear the golf courses will destroy the nutrient-poor balance on which their coral reef and mangrove systems depend. In Saudi Arabia and elsewhere in arid regions, golf courses have been constructed on nothing more than oil-covered sand. Players may use a roller on the "greens" to smooth the intended path before putting. A course in Coober Pedy, Australia, consists of nine holes dug into mounds of sand, diesel fuel, and oil, with no grass appearing anywhere on the course. Players carry a small piece of astroturf from which they tee the ball. Other Australian golf courses in locations where water is scarce or water conservation is a priority sometimes feature "scrapes" in place of greens. These are made of fine dirt which requires raking between uses but does not require watering. 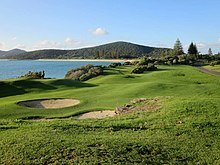 In New Zealand, it is not uncommon for rural courses to have greens fenced off and sheep grazing the fairways. At the 125-year-old Royal Colombo Golf Club in Sri Lanka, steam trains from the Kelani Valley railway run through the course at the 6th hole. ^ "Why does a golf course have 18 holes? ", www.ScottishGolfHistory.org, 2003–2007, webpage: SGH18. ^ Victoria Robb. "The World's Longest Golf Hole". Esquire. Retrieved 10 September 2015. ^ Rules of Golf and the Rules of Amateur Status 2008–2011 (PDF). St Andrews, Fife, Scotland: The Royal and Ancient Golf Club of St Andrews and United States Golf Association. September 2007. p. 67. Archived from the original (PDF) on 29 October 2008. Retrieved 16 September 2008. ^ "USGA Rules of Golf Experience". Usga.org. Retrieved 23 May 2018. ^ "Tifway 419 Bermuda". Phillip Jennings Turf Farms. Retrieved 2 March 2009. ^ "USATODAY.com – Bermuda, bent, rye: Grass types make big difference". usatoday30.usatoday.com. Retrieved 12 November 2016. ^ "Links". Dictionary of the Scots Language. Scottish Language Dictionaries, Edinburgh. Retrieved 16 July 2012. ^ a b "A Brief History of The Links". St Andrews Links Trust. Archived from the original on 4 July 2012. Retrieved 16 July 2012. ^ "Open Venues". The Open Championship. The R&A. Archived from the original on 3 August 2012. Retrieved 16 July 2012. ^ "Pitch and putt rules". EPPA. Archived from the original on 27 October 2013. ^ MW Associates, Edinburgh (February 2003). "Golf Audit Summary Report" (PDF). sportscotland. Retrieved 25 February 2015. ^ a b Lowerson, John (5 May 1983). "Scottish Croquet: The English Golf Boom, 1880–1914". History Today. Retrieved 25 February 2015. ^ Harte, Nigel (24 June 2014). "The decline of municipal golf clubs during the economic downturn". Golf Club Management. Retrieved 25 February 2015. ^ Sources include the National Golf Foundation and the Golf Course Superintendents Association of America GCSAA. Wikimedia Commons has media related to Golf courses.